2. Support distance input based on both odometer reading and trip meter reading. 3. History view shows all your fill-up records, sorted by most recent date, and allows you to edit all entries. 4. 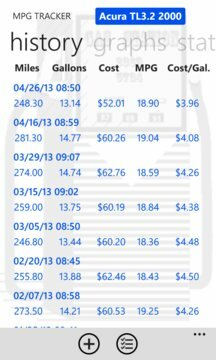 Multiple graphs nicely show you how your MPG progresses and gas price changes over time. 5. 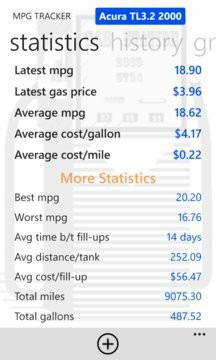 Advanced reports let you compare efficiency among fuel grade, fuel brand, and view monthly expenses on fuel and monthly mileage. 7. Support backup data to OneDrive, allowing to restore data if your phone is broken or to transfer data to another phone. 8. Ability to export to Excel for further report customization and share MPG info via email, SMS, and social networks. 9. Support both imperial and metric system. 10. Live tile support to display current vehicle' MPG statistics right at the phone Start screen. "I used to use an xls spreadsheet on PC + an Android app. on e-pad. This does better than both in info. presented, easier input and all available in my pocket at filling station. Windows phone wins for me and great upgrade from Sams.S2 which was always running out of memory even with 16Gb memory card added." "Best mileage app for WP7 period! **update**. Just migrated my data from WP 7.5 to WP8 seamlessly." "Really handy, totally beats my manual log pad/pencil"
"Excellent app. I can see the value of lower speed and less aggressive acceleration." "Simple, easy, nice. Love it!" "This makes tracking mileage easy. I especially love the statistics and graphs." "Works well, simple, and no problems like an app should." "Perfetto, niente di meno (e qlcs di più) di quel che volevo."